I'm going to move this problem to the technical forum. 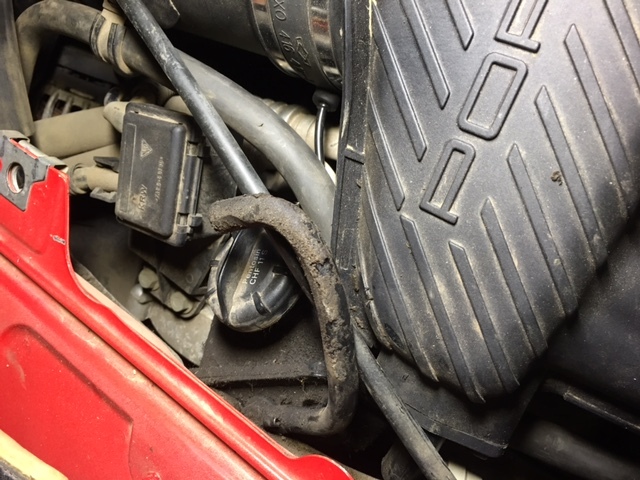 I have a '98 Boxster Base with a rough idle/no rev problem. The battery and plugs are new. The coil packs ohm out. The fuel pump and fuel filter are new. Fuel pressure is rock solid. The vacuum looks to be good. Oil has been changed as well. Could a stuck fuel injector or injectors cause the rough idle and inability to rev about 300 rpm? I'd check your MAF. I had similar symptoms and it turned out my MAF had failed. Disconnecting the MAF made no difference. I am definitely missing on cylinders. Trying to get access to ohm out the injectors. From underneath it's tricky. May have to remove the secondary air pump on the passenger side and the air box on the drivers side to get full access to the injectors and rail. A major vacuum leak would cause this. Are you getting any codes? Does anyone know the proper resistance for the injectors? I got to one and measured 12.2 ohms. I also measured the voltage at the injector connector to be 12 volts with just the key on. Last edited by tada; 03-19-2016 at 03:02 PM. Have you checked for vacuum leaks? I had this happen after doing some work on the intake. Put it back together and couldn't see it from the top, but I had created a vacuum leak when I put it back together wrong. No codes because it wouldn't stay running. If you aren't getting any codes I highly doubt it's anything related to your injectors. Thanks for the replies. I would really like to learn a way to check this vehicle for vacuum leaks. I have checked the vacuum lines on the drivers side that goes to the fuel regulator. I can see no leaks and fuel pressure changed when disconnecting the vacuum line. On the passenger side, I have traced from the intake manifold all the way to the vacuum canister and the four way tee. I can't see any damage to the lines so far. And I can't really do much other than visual inspection. Pin hole leaks would be almost impossible to detect visually. And I can only keep the car running about 15 seconds, so chasing a leak with something like carb cleaner won't work. Keeping it running long enough to troubleshoot is a problem. I'll post a video of it running to give you all a better idea of what I am seeing and hearing. I do appreciate all of your help. You can rent a smoke machine, make your own, or get it to a mechanic to figure out. This is the best way to check for vacuum leaks...with only being able to run for 15 seconds, it isn't a small leak or a pinhole issue if it is caused by a vacuum leak. When was the last time the car ran right? What have you done to it that may require you to check your work? If you retrace those steps you may find the answer. It never ran right, yet. In other threads in the General Discussion area I explained I bought a non runner and am trying to get it going. I haven't heard of these things having much of an issue with injectors. I'd look into a smoke machine to get that at least eliminated as a cause. After that I'm not sure where to lead you with no codes being posted. 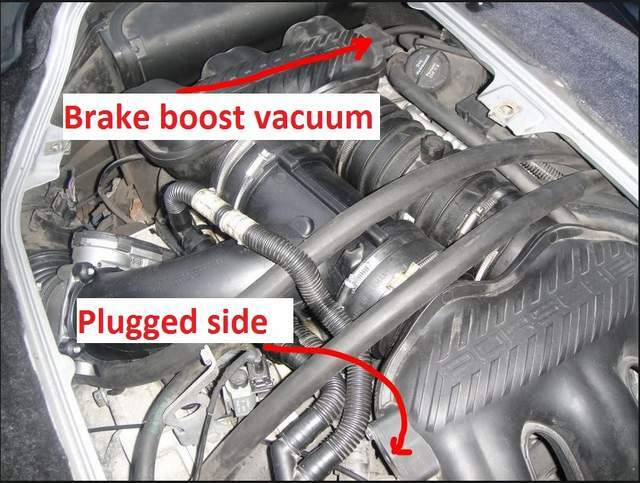 Brake boost vacuum line? That's the biggest one and I'd think most likely to completely stall the engine. It mounts to the front left or right rear intake manifold and the opposing one should be covered/blocked. Mine ran like that when I left the oil fill cap off. It creates a vac leak. Worth checking the cap and the fill tube. Last two posts are good examples of why I'm saying try and track down a vacuum leak. The car will tolerate them for a bit but when they become too large it can no longer compensate and it shuts down. Thank you all again for advice. I'm going to do some disassembly tomorrow and track down that leak. Took the day off and went down to Tubac, AZ (a small artists colony). Bought a couple of pots for my wife and had a great Mexican meal with my wife (the margaritas are hampering car repair). The goal is to have the car running by my 33rd anniversary at Memorial Day and drive it to San Diego. I took a look this morning and found this, should it attach to something? That looks like the power steering overflow hose. It doesn't attach to anything.